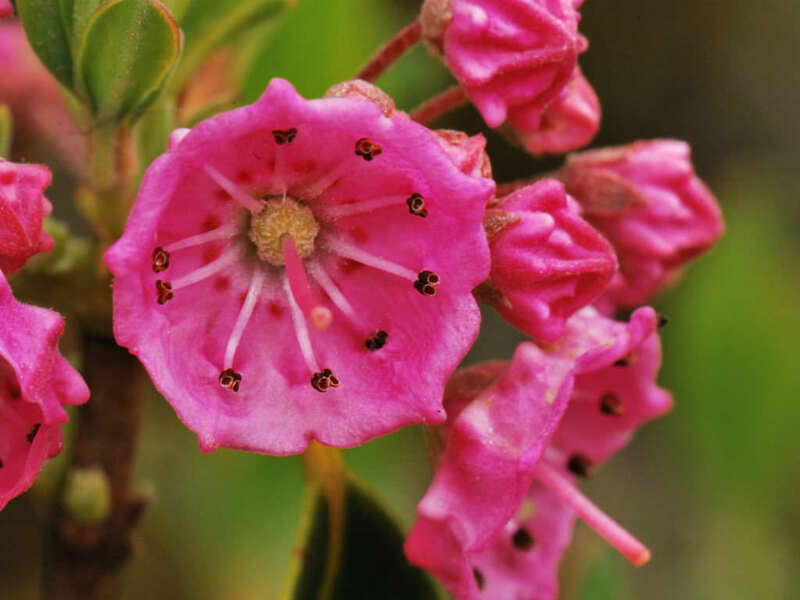 Kalmia angustifolia is a flowering shrub up to 3 feet (90 cm) tall. The narrow evergreen leaves, pale on the underside, have a tendency to emerge from the stem in groups of three. A peculiarity of the plant is that clusters of leaves usually terminate the woody stem, for the flowers grow in whorls or in clusters below the stem apex. 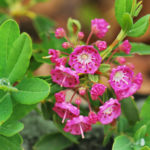 The attractive small, deep crimson-pink flowers are produced in early summer. 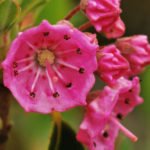 Each has five sepals, with a corolla of five fused petals, and ten stamens fused to the corolla. 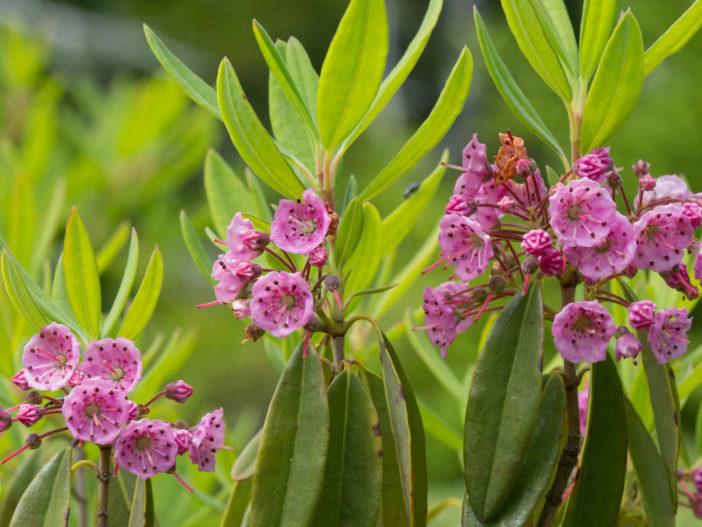 Mountain Laurel is hardy to zone 5. In colder areas it will need to be protected in winter with burlap barriers to block the winter wind. Purchase plants from your local garden center. Look for the hardiest varieties for cold areas. Plant shrubs from spring, after all danger of frost has passed, to summer in well drained, moist, acidic, cool soils. Avoid windy areas, if possible. Space plants 4 to 6 feet (1.2 to 1.8 m) apart. Keep young shrubs well watered. Keep the soil evenly moist and acidic with a layer of wood chips or evergreen bark mulch. 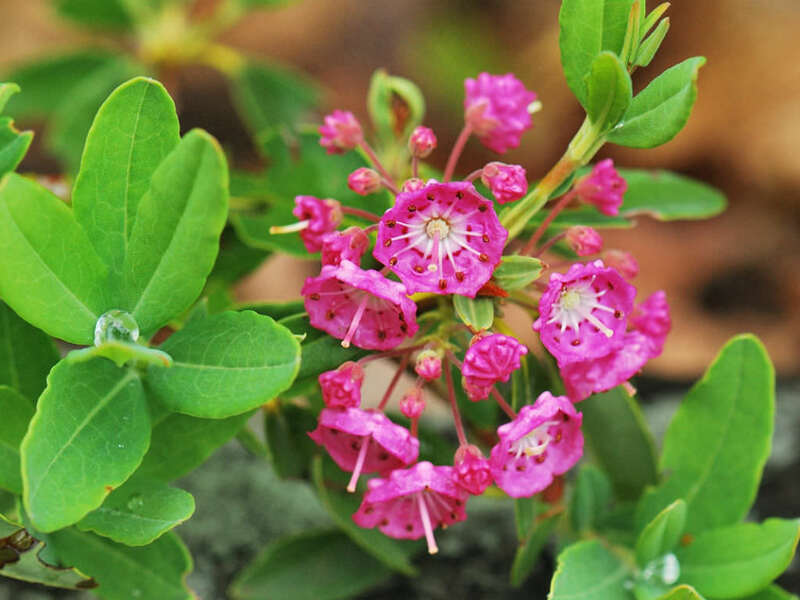 Fertilize mountain laurel in spring with a plant food for acidic-loving plants such as you’d use for Rhododendrons. 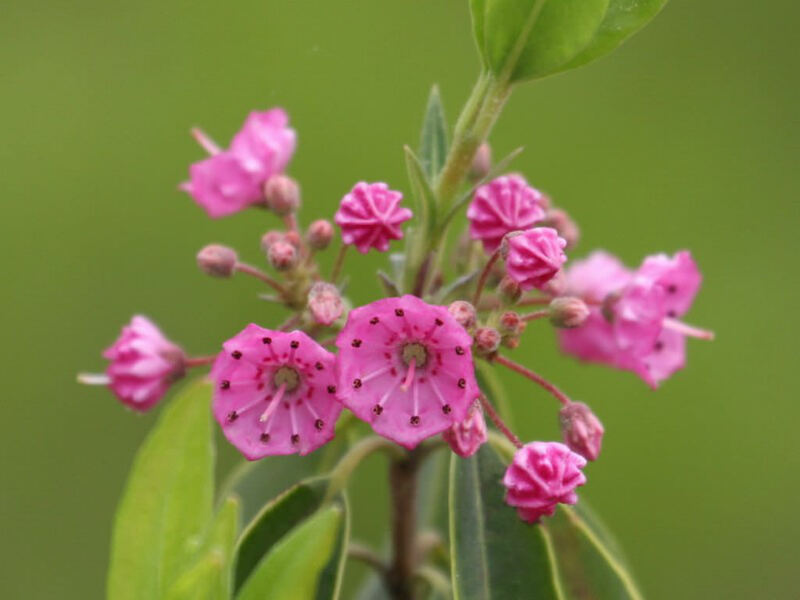 Mountain Laurel will get spindly, develop leaf spots and have few flowers if grown in too much shade. Look for leaf spot resistant varieties if growing under these conditions. It also doesn’t grow well in poorly drained soils. It’s a slow grower that should only be pruned to shape the plant in spring after flowering. Dead, diseased and broken branches can be taken out at any time. 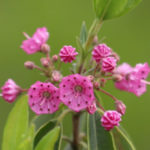 Mountain laurel doesn’t have many pest problems… – See more at: How to Grow and Care for Mountain Laurel. It is distributed in eastern North America from Ontario and Quebec south to Virginia. Next Article What is a Vine?